Acuity Cloud Solutions (Acuity), a leading provider of HCM cloud-based application support and services, and Gold-level member of the Oracle PartnerNetwork (OPN), will be delivering an engaging information session about new and innovative features within Oracle HCM, Oracle Talent Acquisition Cloud (OTAC) and TeamTexter. 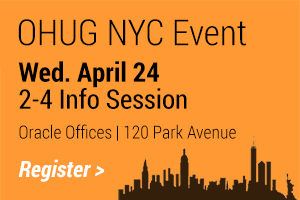 The event will take place on April 24, 2019 from 2 to 4 pm EST at the Oracle Offices, 120 Park Avenue in New York City, NY. Presenters from Acuity will share new and upcoming functionality for Oracle HCM Cloud and changes and future functionality for Taleo Business Edition and OTAC. Additionally, a demonstration will be shared for TeamTexter, a texting service for recruiting and onboarding that improves candidate pipelines and engagement, time to fill, and onboarding completion times. For more information and to register for this event, please visit our registration page. Customers who aren’t able to attend and would like more information about these important topics are invited to contact Acuity to schedule a meeting. About Acuity Cloud Solutions Acuity Cloud Solutions specializes in delivering HCM cloud solutions, with a focus on Oracle HCM Cloud systems and other industry leading HR technologies. The team boasts over 100 years’ combined experience delivering implementations, migrations, upgrades, system administration, training, support, project management, and delivering value-add solutions to its customers. Drawing from thousands of successful client engagements in a wide variety of industries, Acuity’s experts deliver best practices and innovative solutions ensuring systems are aligned with business processes, implemented efficiently, and optimized to their highest potential.